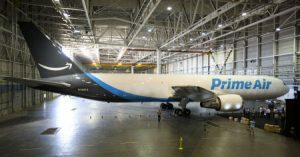 Today, a published report from Bloomberg indicates that pilots working for Amazon’s leased air freight contractors Air Transport Services Group (ATSG) and Atlas Air Worldwide Holdings have taken to social media to warn that Amazon might not be able to deliver last-minute holiday packages. Advertisements on Facebook and Goggle targeting Amazon online customers provide a web link to the website: canamazondeliver.com, which has sponsorship from the Airline Professionals Association, Teamsters Local 1224. Readers may have already encountered such postings and links. The dedicated web site asserts that both leased carriers had taken on Amazon contracted work despite known pilot staffing problems. Further asserted is that many of the existing pilots are seeking new jobs because of excessive duty hours. As Bloomberg points out, the broader issue is ongoing contract negotiations with over 1600 pilots employed by both contract carriers. More than likely those negotiations include provisions related to pilot work hours. In mid-November, a work stoppage among 250 cargo airline pilots working at ABX Air, a subsidiary of ATSG grounded more than 75 flights contracted for both Amazon and DHL Worldwide Express. The move came just before the start of busy Thanksgiving, Black Friday, and Cyber Monday holiday shopping events. That action was quickly stopped by a court order citing provisions of the National Railway Labor Act that prevents labor disputes from disrupting commerce. Thus, pilots have opted to utilize other methods to gain bargaining table leverage including this social media campaign declaring that there may not be enough pilots to deliver for Amazon in the coming days. We have previously highlighted a prior strike vote among UPS maintenance workers who maintain UPS’s fleet of aircraft after contract talks remained deadlocked over the issue of health-care benefits. Our stated view was that it does not seem likely that a labor strike will occur during the crucial holiday fulfillment period essentially because of the criticality of moving freight volumes for the next 8 days. However, what should be of concern is a potential air lift capacity bottleneck in the coming days that could impact certain retailers and last-minute shippers. First, Amazon has already made contingency airlift backup plans that likely include FedEx and UPS as a fallback. As noted, UPS maintenance workers could conceivably enact a work slowdown, especially since the UPS air fleet will operate at maximum capacity in the coming days, requiring inevitable maintenance issues. FedEx will have its own issues having to support Amazon, customer contracted or UPS contingency backup. What this likely means is that airlift capacity will be highly restricted or overbooked next week. Retailers planning on last-minute holiday promotions, and there may be lots of them, that assume that air will be the fallback option to assure delivery by the Hunukkah and Christmas holidays should be re-validating available air lift capacity. As has been in prior years, Amazon’s sheer scale and dominance will prevail and its contingency options will either consume any remaining air capacity, or FedEx and UPS will say no and honor last-minute retailer needs. The clear takeaway for online retailers is to plan and validate on a daily basis all of next week. The takeaway for online consumers is to consider completing all online holiday related shopping now and do not wait until later next week if you want your merchandise by the holiday. Over the weekend, we executed an online order with Amazon for a non-holiday related purchase. We were offered a $10 Amazon gift certificate to defer delivery until after the Christmas holiday with one option for a ten day delivery. Looks to us that Amazon is now actively managing air capacity management for this week.